The U.S.-Canada Joint Statement on Climate, Energy, and Arctic Leadership highlighted the role of carbon markets at the federal and subnational level in achieving climate policy objectives. The launch of a series of related MIT CEEPR Working Papers serves as a timely occasion to discuss recent experiences with emissions trading in North America and abroad, as well as opportunities for future climate policy cooperation under the Paris Agreement. The Québec Government Office was proud to sponsor the academic symposium, Emissions Trading in North America and Beyond, organized by the MIT Center for Energy and Environmental Policy Research and co-sponsored by the German Consulate General Boston. 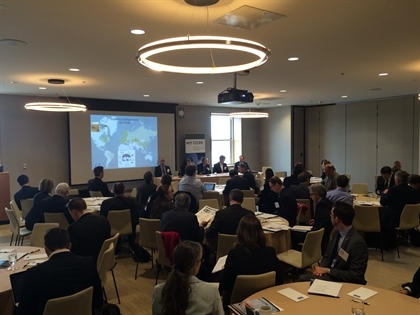 The forum provided local stakeholders with a glimpse of emissions trading systems from Asia to Europe, with a focus on emerging trends in Canada and the United States. Professors, researchers, and various analysts came together to discuss the future of carbon pricing, and the prospects for a cleaner, greener economy in North American and beyond. The event was sponsored through the Québec / United States University Grant Program. The full report from MIT-CEEPR is available here.